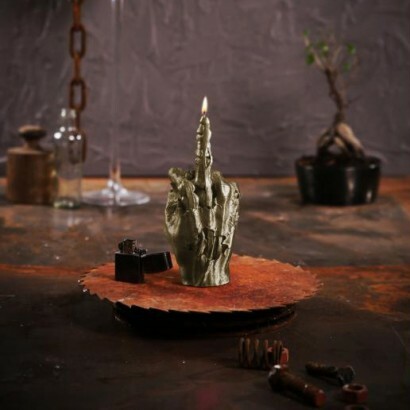 Zombie Brass Hand Candle "The Bird"
Review Zombie Brass Hand Candle "The Bird"
Zombies don't have the same vocal range as us "living" humans, what with the odd grunt or groan they struggle to get their point across and so sometimes they need to rely on a little body language; this zombie finger gets the point across perfectly, and this zombie's definitely having a bad day! 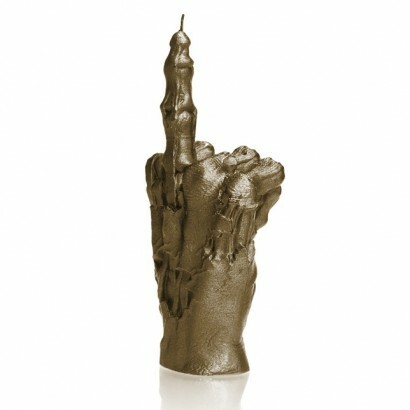 Modeled on a large (living) human male hand, this metallic brass candle resembles a creepy zombie hand, middle finger extended to the land of the living with flesh rotting away to show the skeleton and tendons inside. With a 30 hour burn time, this large candle burns down the middle finger making the candle a politer symbol as the wax melts away.